A common science class or home learning activity involves watering a plant or cut flower with food coloring-laced water to observe and record the changes, if any, the plant or flower undergoes as a result of the dye. Because these classroom experiments are carried out under differing conditions, the results are often varied. Understanding the function of a plant helps understand why some plants or flowers can be successfully dyed, while others cannot. A plant that is rooted into soil, whether in a container or in the ground, depends on the roots to deliver nutrients to the rest of the plant. Each plant has a main root from which branches smaller roots. On all of these roots are tiny hair-like structures called, appropriately, root hairs. Water is absorbed through the root hairs, into the roots and delivered into the root’s center, which is called the stele. According to the Oracle Education Foundation ThinkQuest website, the plant’s veins, also called xylem, are found in the stele. These veins carry the water and other nutrients throughout the rest of the plant to the stems, leaves and flowers, if any. A rooted plant’s first defensive barrier is the roots. 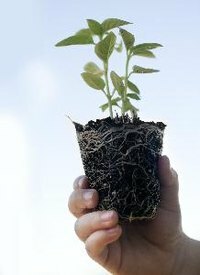 The MadSci Network says that roots typically absorb only the nutrients and minerals that a plant needs. Toxins and other unnecessary soil components are filtered out and the plant is protected. Watering a rooted plant with colored water will usually result in little color change to the plant because the roots keep the dye from entering into the stele, and subsequently into the plant. Any color change noticed will likely occur only in plants with white coloring or flowers. Flowers that have been cut from their roots, such as a long-stemmed carnation, function differently than a rooted plant. When someone receives flowers from an admirer, the first thing usually they usually do is put the flowers into a vase of water. Since the plant has no roots to feed it, water and nutrients are absorbed directly into the veins. Bypassing the now-absent roots eliminates the plant’s defense system and allows colored water direct access to the flower or leaves. MadSci Network suggests experimenting with daisies, Queen Anne’s lace, carnations, mums and almost any light- or white-colored flower. The dye best manifests around the edges of flower petals and leaves. Flowers that secrete natural gums or residues, such as dandelions, usually don’t absorb colored water very well because the cut stems seal with their own secretions and dye and water absorption is limited. Some rooted plants can be dyed by using natural minerals rather than food coloring or other dye-enriched water. The soil must be directly mixed with the minerals. These minerals in the soil create a chemical alteration of the rooted plant’s natural colors. MadSci Network suggests using aluminum sulfate and sulfur to alter the pH levels of the soil to create color changes of blue and pink to the plants flowers or light-colored leaves.